We're virtually four months away from Christmas, but the holiday season in the Philippines essentially starts today. Just take a look at the parols that have come out of nowhere, the resurrected lights that were dead for the first eight months, the ungodly Grab surge (hopefully, none this year), and all the other premature Pinoy yuletide traditions. But the biggest sign that Christmas is coming: Jose Mari Chan's "Christmas in our Hearts" blasting through every speaker in the city. In a previous interview with FHM, the 73-year-old hitmaker admitted that he isn't a fan of the "Father of Christmas Music" title given to him: "I have to protest about that. I don't deserve the tag. Christmas to me is a meaningful word and is at the center of our faith. To say na kapag Christmas kontrolado ko ang mga malls and the Christmas music they play might appear as egoistic and that I am an ego-bloated artist. I don't welcome the tag." For Chan, "Just hearing the songs played and sung at Holy Mass, in the malls, or parties is a good feeling enough. It is gratifying." 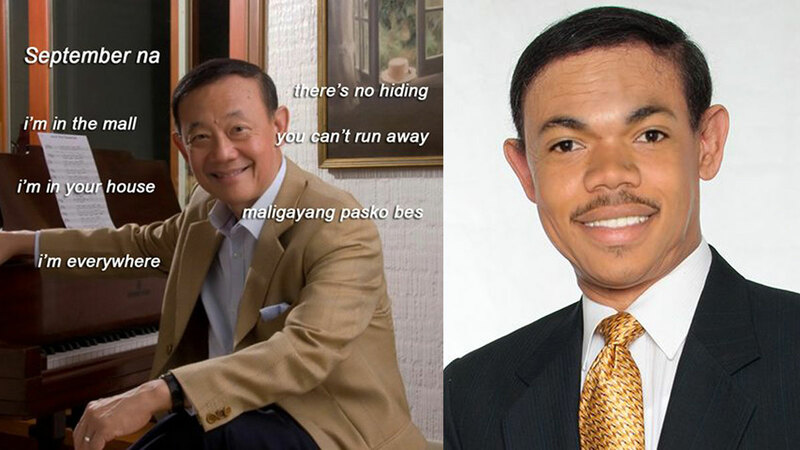 Still, netizens can't helps but pay homage to the OPM icon, giving him the gift of hilarious memes when September arrives.